Named after its inventor, Bryan Kibble at the U.K.’s National Physical Laboratory (NPL), who conceptualized it in 1975, the Kibble balance is an exquisitely accurate weighing machine. 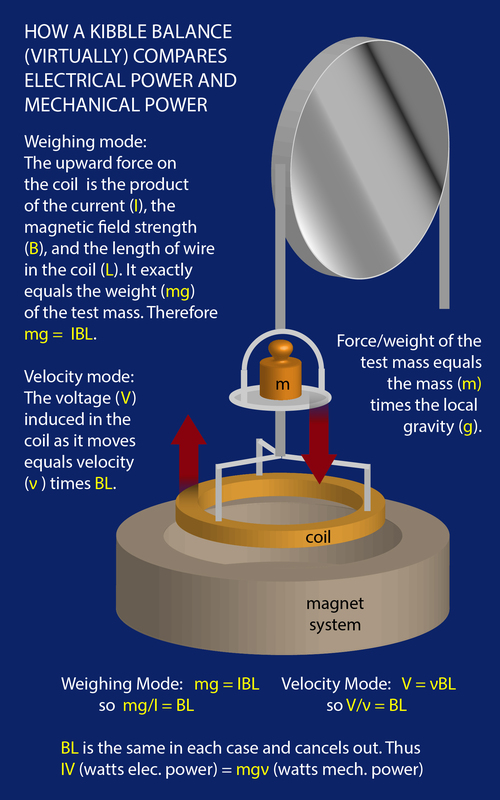 Like any balance, it is designed to equalize one force with another: In this case, the weight of a test mass is exactly offset by a force produced when an electrical current is run through a coil of wire immersed in a surrounding magnetic field. The surrounding field is provided by a large permanent magnet system or an electromagnet. The moveable coil, once electrified, becomes an electromagnet with a field strength proportional to the amount of current it conducts. When the coil's field interacts with the surrounding magnetic field, an upward force is exerted on the coil. The magnitude of that force is controlled by adjusting the current. Basic principles of the Kibble balance, a device that can be used to measure mass. The instrument was originally called a "watt” balance because it makes measurements of both current and voltage in the coil, the product of which is expressed in watts, the SI unit of power. That product equals the mechanical power of the test mass in motion. Current and voltage are measured in two separate stages, or modes, of operation. In "weighing" or "force" mode, a test mass is placed on a pan that is attached to the coil. It exerts a downward force -- its weight -- which is equal to its mass (m) times the local gravitational field (g). The current applied to the coil is then adjusted until the upward force on the coil precisely balances the downward force of the weight. When the system reaches equilibrium, the current is recorded. At this point, it might seem that the job is finished. After all, the force (F) on the coil – which equals the weight of the mass – can be calculated with a simple equation that dates from the 19th century: F = IBL, where I is the current, B is the magnetic field strength, and L is the length of the wire in the coil. However, as a practical matter, the product BL is extremely hard to measure directly to the necessary accuracy. Fortunately, physics provides a way around that problem via yet another relationship revealed in the mid-19th century: induction. Michael Faraday discovered that a voltage is induced in a conductor when it travels through a magnetic field, and that the voltage is exactly proportional to the field strength and the velocity. So if the velocity is constant, the induced voltage is a sensitive measure of the field strength. That phenomenon is the basis for the Kibble balance's second stage, called "velocity" or "calibration" mode. For this operation, the test mass is removed and the applied current through the coil is shut off. The coil is then moved through the surrounding field at a carefully controlled constant velocity. The resulting induced voltage is measured. Again, an uncomplicated formula governs the magnitude of the induced voltage: V = νBL, where B and L are the very same field strength and wire length as in weighing mode, and ν is the velocity. When this equation is combined with the one above for force on the coil, the problematic B and L cancel out, leaving IV = mgν. (That is, electrical power equals mechanical power,* both expressed in watts.) Or, solving for mass, m = IV/gν. Everything on the right side of that equation can be determined to extraordinary precision: The current and voltage by using quantum-electrical effects that are measurable on laboratory instruments; the local gravitational field by using an ultra-sensitive, on-site device called an absolute gravimeter; and the velocity by tracking the coil's motion with laser interferometry, which operates at the scale of the wavelength of the laser light. Where is the Planck constant, h, in all this? It comes into play in the way current and voltage are measured using two different physical constants. Both constants are defined in terms of h and the charge of the electron, e. Those are very small quantities. Yet both are manifest in measurable macroscopic phenomena. Because of these connections to the Planck constant, a Kibble balance can measure h when the mass is exactly known (as in the case of a 1 kg standard), or it can measure an unknown mass if h is exactly known. The impending redefinition of the kilogram will assign a specific fixed value to h, allowing Kibble balances to measure mass without recourse to the IPK or any physical object. NIST has operated Kibble balances of various configurations since the early 1980s, shortly after the device was first conceptualized by Kibble. NIST now operates its fourth-generation instrument, called NIST-4. 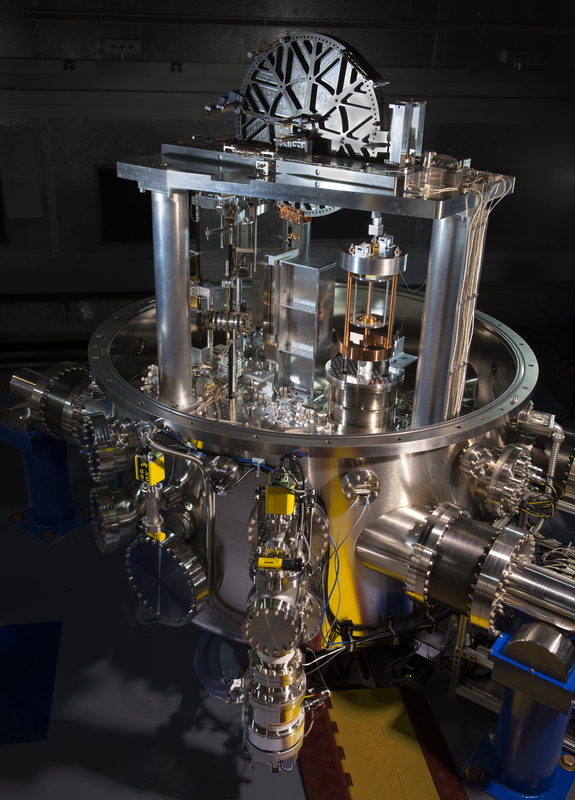 NIST-4, which began full operation in early 2015, was designed to satisfy the exacting measurement requirements that must be met in order to redefine the kilogram. In time, NIST-4 will become the official U.S. standard for realizing mass — a role presently played by K20, NIST's national prototype kilogram. The principles of NIST-4 are depicted in the animation below. NIST-4 is located in the fully shielded, environmentally controlled Advanced Measurement Laboratory complex, deep underground on the NIST campus in Gaithersburg, Maryland. When in operation, the NIST-4 Kibble balance is covered by a vacuum enclosure. 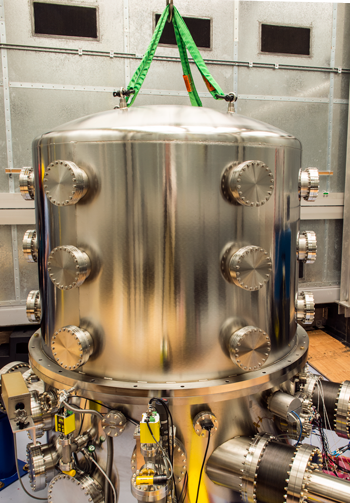 The entire unit is about 2.5 meters (8 feet) tall, and covered with a metal vacuum enclosure. Measurements are made in a vacuum to eliminate effects of air buoyancy, which are significant at the desired level of precision. Like its predecessor, NIST-3, it employs a balance wheel that rotates on an ultra-hard knife edge. On one side of the wheel, a cable supports the structure that contains the pan for a test mass as well as an electromagnetic coil beneath it. On the other side are the offsetting tare (counter) mass and the motor that moves the mass and coil vertically to perform one set of measurements. Researchers use a crane to lower a vacuum enclosure onto NIST's new watt balance. Note: Except at beginning and end, playback is about 5x actual speed. Some other designs — such as the Kibble balance formerly at NPL and now at the National Research Council of Canada — use a horizontal balance beam as opposed to the NIST-4’s wheel balance. One advantage of the wheel configuration is that it allows the supporting cables to move the coil exactly vertically, thereby avoiding the undesirable sideways motion that a coil suspended from a beam balance can experience. In order to achieve the target uncertainty for realizing mass, any forces or torques that are not precisely vertical have to be minimized to no more than 3 parts per billion. The moving wire coil weighs 4 kg, has a diameter of 43 cm and requires about 1.4 km of wire. The NIST-4 uses a custom-built, 1,000-kg permanent-magnet system. It produces a 0.55 Tesla magnetic field (approximately 10,000 times greater than Earth’s magnetic field) into which the coil is immersed. The components are made from iron and an alloy of samarium and cobalt. Because the coil is situated within this enclosure, it is completely shielded from environmental magnetic fields, so a non-magnetic laboratory is not required as it was for its predecessor, NIST-3. The permanent-magnet configuration allows the new apparatus to be more compact than previous designs that used superconducting magnets. The balance is shorter, which makes it easier to service and align. And its location places it within easy access for scientists to NIST’s voltage and resistance laboratories in which the national values for the volt and the ohm (the unit of electrical resistance) are realized. That proximity is important to the Kibble balance experiment since it relies on both those measurements.